In our family each one of us plays different roles, some are better at organizing, some are better at cleaning, some are better at baking, and some are better at cooking. The best cook in our family is my wonderful husband. Cooking has been something I'm always trying to get better at, I love experimenting with new recipes to see if they will turn out. 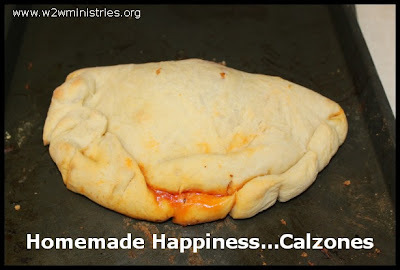 One thing I have always wanted to make are calzones. I recently came across a recipe from a wonderful blog I found called Pennies and Pancakes. The recipes were for pizza sauce and dough, I adapted a few things and they turned out really well for calzones. First, begin by making the dough. Combine dry ingredients into a large bowl or mixer, add water and oil, mix dough until it forms a ball. Add additional flour as needed. Kneed until it forms a firm ball. Cover and let rise 1 hour. 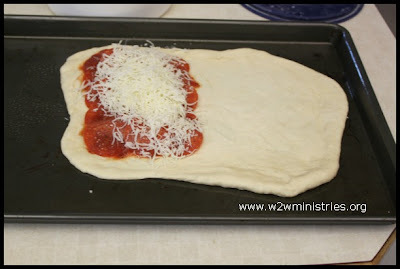 While the dough is rising make your sauce and prepare any other ingredients that you want in your calzones. Combine all ingredients in a medium saucepan over medium/high heat. 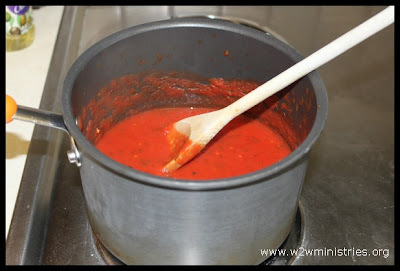 When it boils reduce heat to low, let simmer 20 minutes. On 1/2 of the dough layer with sauce, desired meat, (pepperoni, Canadian bacon, sausage, hamburger, whatever your family enjoys) and mozzarella cheese. Repeat. 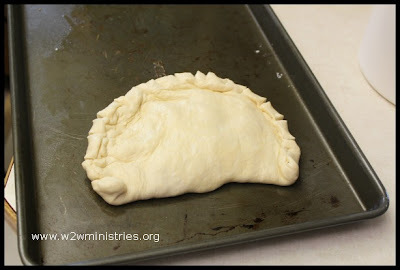 Fold dough over, forming a half circle, roll up the sides, slice the edges, cut two holes on top to vent. Brush the outside with and egg wash, or butter for golden brown effect. Bake 18 -20 minutes. Makes 4 calzones. Enjoy!